Laurentides is a Québec region north of Montréal, crossed by the rounded Laurentian Mountains, vast forests and thousands of kilometres of cross-country skiing trails. Popular resorts include Mont-Tremblant, with downhill skiing and a brightly coloured pedestrian village; Sainte-Adèle, with a number of spas; and Saint-Sauveur, with downhill skiing in winter and the massive Parc Aquatique water park in summer. In 2002, the decision was taken to update the existing farmhouse and renovate most of the structure in order to facilitate the production of wine. Today, the winery consists of a modest 3,000 square foot building with a 250 square foot climate controlled cellar and a new 500 square foot fermentation room addition (constructed in the summer of 2004). The Carone family is constantly renovating the winery and expects to have most of the finishing touches completed by fall of 2006. In 2004, current production volume reached approximately 1,000 cases/year which is based on a direct correlation to the number of existing grapevines in the vineyard. Carone produces mainly red wines from grapes grown on a 1.5 hectare plot. Lanoraie a signature wine, a medium bodied red, produced from a field blend of Cabernet Severnyi, Frontenac and Landot. Lanoraie is full of dark ripe black fruit flavours with lots of smoky oak, liquorice and vanilla. This particular wine is aged in new American oak barrels for a period of 6 to 8 months before bottling. 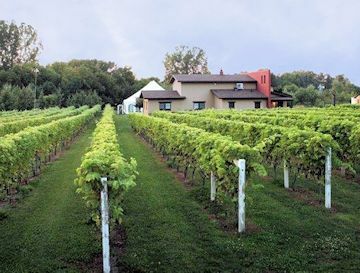 To become Quebec’s top-ten wine company by growing premium wine grapes in the Lanaudière Valley and producing the finest New World wines. The winery firmly believes that quality wines are born in the vineyard. Our wines inheritably are created from combining Italian heritage to the Quebec terroir; an approach that delivers incredibly distinctive wines that defines the very best of the Lanaudière Valley. Carone’s greatest asset is in its field-blended vineyard, where grapevines are trained low to the ground, spaced closely with one another and intermingled with other varieties at less than 2 feet intervals. Premium quality wine grapes are characteristically chosen for their obvious quality features as well as their climatic endurance. The wines are skillfully crafted from field-blending, an age-old tradition, at harvest time, which supports the notion that winemaking begins in the vineyard and not in the cellar. These wines have higher levels of complexity and nuance and are a unique expression of the grapes. This amazing 8-hectare (close to 20 acres) vineyard in Saint-Sulpice, Lanaudière, is located in the middle of the St. Lawrence, on Île Ronde. An exceptional climate that favours the production of reds, whites and rosés, as well as three Port-style fortified wines. You need to take a boat to get to the island where it is situated. Contact the winery for boat departure times. 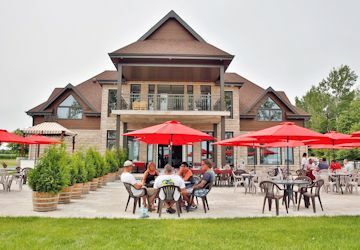 À 35 minutes du centre-ville de Montréal, le Domaine de l'Île Ronde est fier de vous proposer six vins locaux uniques ainsi qu'un paysage enchanteur. Maurice Mondor & Gaetan Mondor owners, once grew tobacco but now have changed over to growing grapes. Vines were planted in 2008-09 providing 3100 vines. 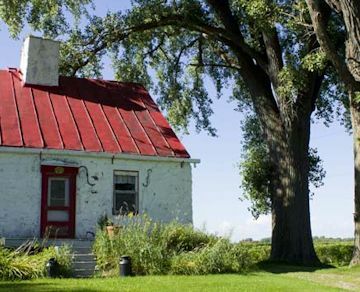 The Vignoble Saint-Gabriel is located on a rocky hillside, near Maskinongé Lake. Its orientation promotes maximum sunshine, which gives its wines exceptional qualities. The rustic vines (Minnesota hybrids) are worked with great care and no fungicide, insecticide or herbicide is used. We apply organic fertilizer. The wines produced are organic, certified by Ecocert Canada. Le Vignoble Saint-Gabriel est situé sur un coteau rocailleux, à proximité du Lac Maskinongé. Son orientation favorise un ensoleillement maximum, ce qui confrère à ses vins des qualités exceptionnelles. Les vignes rustiques (hybrides du Minnesota) sont travaillées avec grand soin et aucun fongicide, insecticide ou herbicide n’est utilisé. Nous appliquons des engrais bio. Les vins produits sont biologiques, certifiés par Ecocert Canada. 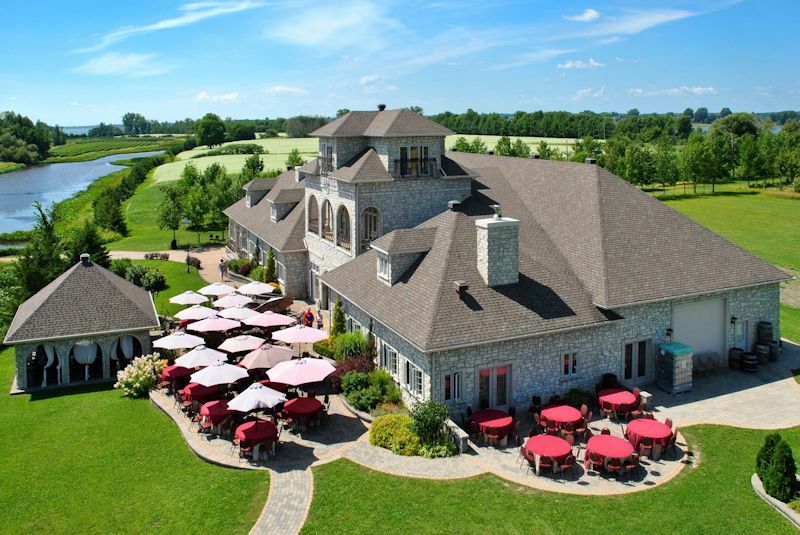 The wine cellar of the Vignoble Saint-Gabriel has become a major tourist attraction in Lanaudière. 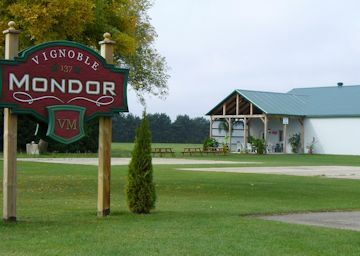 La cave à vin du Vignoble Saint-Gabriel est devenue un attrait touristique majeur dans Lanaudière. Construite en 2012 à partir d’un viaduc routier, notre cave à vin, d’une dimension imposante de 11 m sur 18 m, contient présentement 110 fûts de chêne français de 225 litres. Located in the heart of the Lake St-Pierre archipelago. Owned by Guy Chapleau and Guylaine Fauteux. 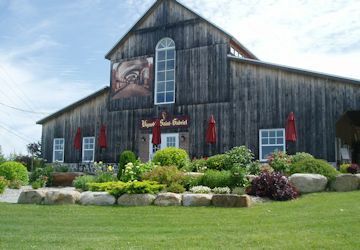 Clos St-Ignace is a family business consisting of a vineyard and an orchard. We produce artisanal wines and an ice cider made exclusively from the fruits harvested at the property. The vineyard was erected on the sandy land that produced the famous blond tobacco of St. Thomas. The vineyard took root in 2004 on these noble and fertile lands and was created by Mrs Lucille Mercier and Mr Jean-Marc Harnois under the name of vineyard Le Mernois. Éric Gagnon, Annie Pronovost, Alain Vallières and Myriam Pelletier acquired the property in 2013. Having spent two years in Switzerland learning wine techniques, Éric shares his experience and passion for wine. Le vignoble a été érigé sur les terres sablonneuses qui ont produit le célèbre tabac blond de Saint-Thomas. Le vignoble a pris racine en 2004 sur ces terre nobles et fertiles et a été crée par Madame Lucille Mercier et Monsieur Jean-Marc Harnois sous le nom de vignoble Le Mernois. C’est en 2013 qu’Éric Gagnon, Annie Pronovost, Alain Vallières et Myriam Pelletier ont acquis cette propriété. Ayant vécu deux ans en Suisse à apprendre les techniques viticoles, Éric nous partage aujourd’hui son expérience et sa passion pour le vin. Grape varieties are the Frontenac, the Marquette, the Aldamina, the Sainte-Croix, the Radisson, the Sabrevois and the Swenson White. We also have Merlot, this famous Bordeaux grape variety. Thewines owe their beautiful qualities to the sandy soil that ensures that the roots of the vines must go deeply to draw their nutrients. The rich sediments left by the passage of the Champlain Sea and the silica levels of the soil create a special climate favorable to the cultivation of the vine. They produce about 20,000 bottles a year. Lano d'or, vineyard near Lanoraie in the region of Lanaudière is the wonderful result of a great dream, a succession of ideas and a single project; that of transforming a large land of more than 5 hectares into vineyard. 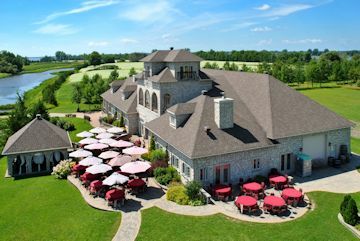 The enchanting site along the St. Lawrence River has a magnificent terrace where you can enjoy a wine of the vineyard, according to the judicious advice of one of our sommeliers. The Lano d'Or vineyard was inaugurated in August 2013. The winery is owned by Alain Coutu.He has more than 5 hectares and 7000 plants, an expansion is planned. The first vineyard to be established in the Region of Lanudière, an old raspberry transformed in 1997. The origin of the name Aux Pieds des Noyers comes from a plantation of walnut trees made in 2000 by the son of the owners Hugo who sensitized and directed the development of the company with an environmental concern. We invite the wineries, cideries amd meaderies of Quebec to contact us and provide information, listing are free. Nous invitons les caves, cidreries et meaderies du Québec à nous contacter et à nous fournir des informations, les inscriptions sont gratuites.